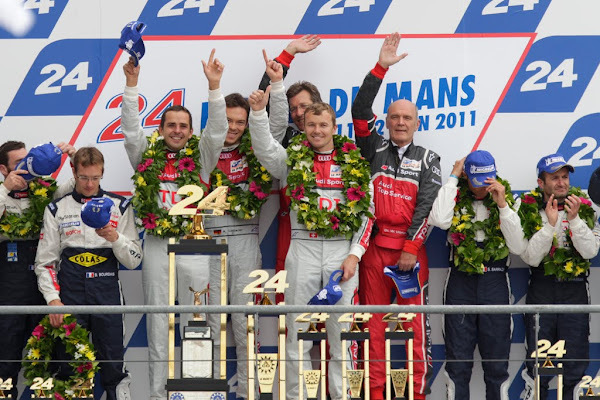 Clinching the brand's 10th overall victory, Audi prevailed against all odds in one of the most thrilling races in Le Mans history. 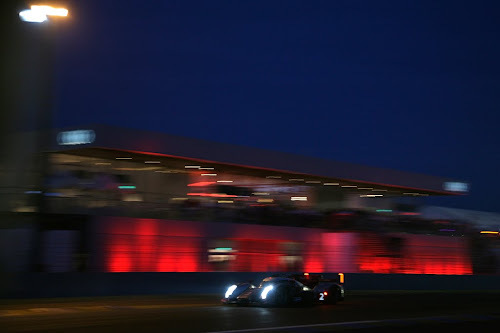 Following devastating crashes by Allan McNish and Mike Rockenfeller, the #2 Audi R18 TDI driven by Marcel Fässler, André Lotterer and Benoît Tréluyer would find themselves alone against four determined Peugeots and 16 hours on the clock. 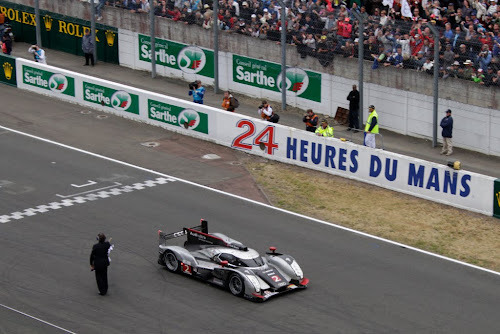 By the 24-hour mark though, André Lotterer would pass the checkered flag just 15 seconds ahead of his French rival to win an epic 2011 24 Hours of Le Mans. Ingolstadt/Le Mans, June 12, 2011 – At one of the most thrilling and dramatic 24-hour races in Le Mans history Audi-ultra-lightweight technology has prevailed. 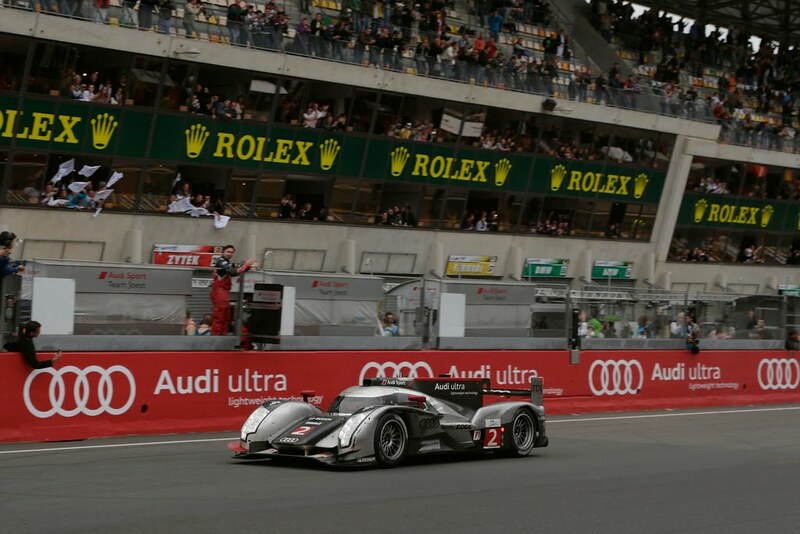 At the fascinating thriller which kept 250,000 spectators at the race track and millions in front of their TV sets watching in awe Marcel Fässler (Switzerland), André Lotterer (Germany) and Benoît Tréluyer (France) in the innovative Audi R18 TDI clinched the tenth Le Mans victory in total for the brand with the four rings. The drama at the 79th edition of the world’s most famous endurance could hardly be surpassed. After Audi had lost two of its Audi R18 TDI cars as early as in the first third of the race due to accidents all hopes were pinned on car number "2” that had secured the pole position in qualifying for Audi. 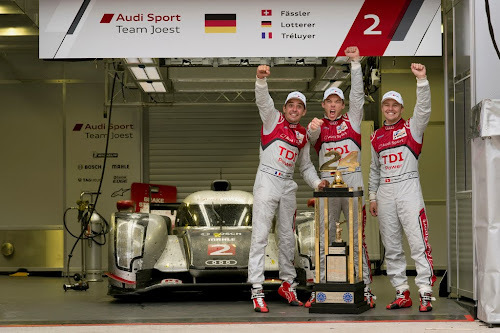 For 16 hours Fässler, Lotterer and Tréluyer were on their own in the battle against three factory-fielded Peugeot cars that left no stone unturned to keep Audi from taking victory. The reliability of the new Audi R18 TDI was impressive as well. Across the entire race distance the vehicle designated as number "2” did not have to come in for a single unscheduled pit stop. Only a problem with the fuel tank caused a bit of a headache for Head of Audi Motorsport Dr. Wolfgang Ullrich and the Technical Director of Audi Sport Team Joest, Ralf Jüttner. The full 65-liter capacity could not be used. 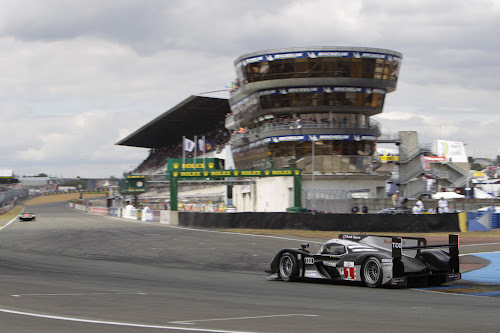 Consequently, André Lotterer had to achieve a sufficient lead for an additional refueling stop in the final phase – in extremely difficult conditions in drizzling rain at times which made the track extremely slippery. Lotterer mastered this hurdle as well. 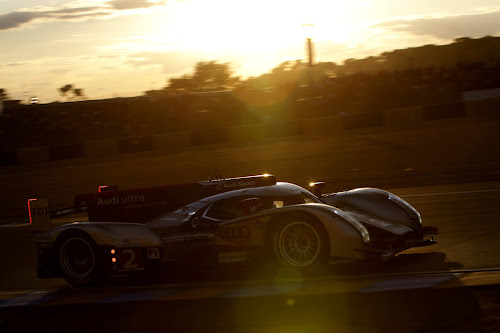 After the final stop the German started his last stint with a seven-second advantage over the second-placed Peugeot. In the end he crossed the finish line after 24 hours being frenetically cheered by his team colleagues Marcel Fässler and Benoît Tréluyer and the entire Audi squad in first place with a lead of 13.420 seconds. For the three Audi drivers who had finished as the runners-up last year this marked the first Le Mans exploit – and the tenth for Audi. 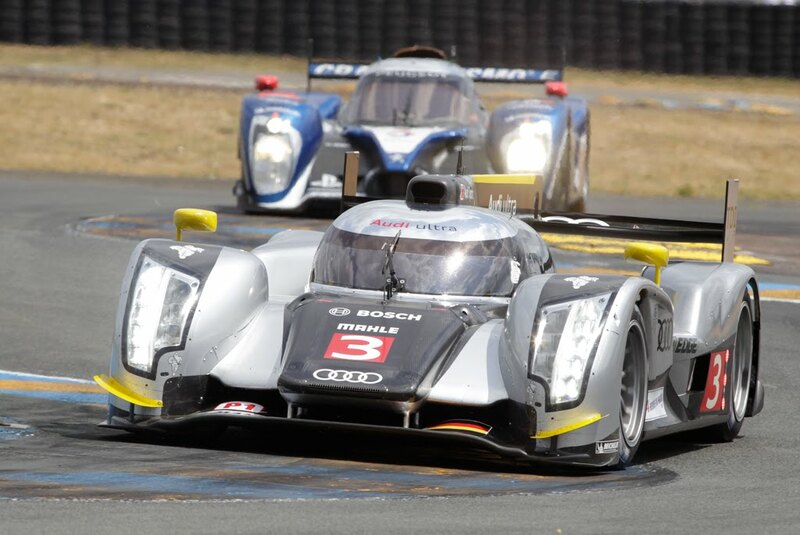 Allan McNish and Mike Rockenfeller sustained no injuries in extremely severe accidents in the first third of the race. 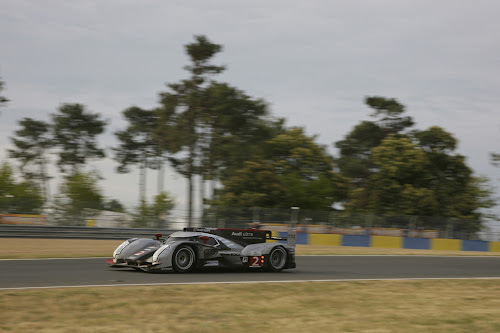 McNish in the Audi R18 TDI designated as car number "3” had taken the lead shortly before the end of the first hour when a GT car hit his left rear wheel in the "La Chappelle” section. The R18 TDI spun off the track, hit the track barrier in a heavy impact and rolled over. 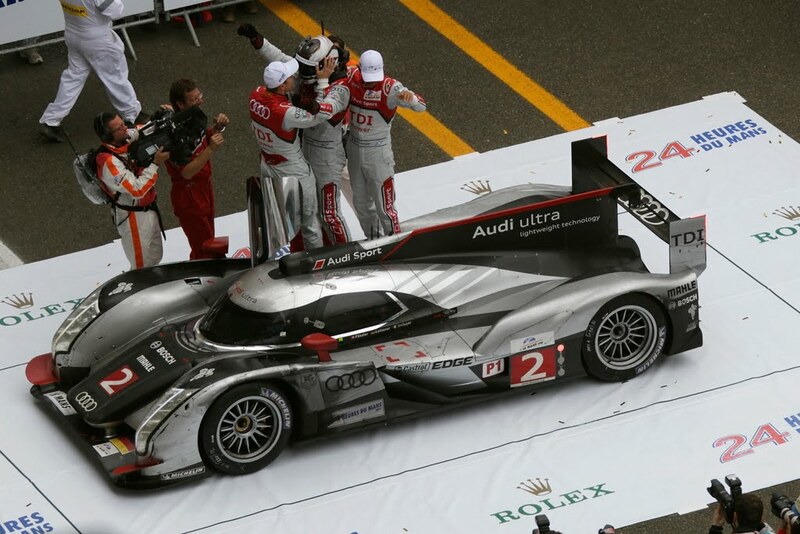 The Audi R18 TDI’s one-piece carbon fiber monocoque withstood the crash. McNish was able to climb out of the wreckage uninjured and returned to the race track after a precautionary medical check at the hospital. Mike Rockenfeller had an even greater guardian angel when shortly before 11 p.m. while running on position two he was also touched by a GT vehicle on the left rear wheel while running at a speed of about 300 km/h. The Audi R18 TDI turned left and at 270 km/h hit the guard rails on the entrance to the "Indianapolis” turn. The carbon fiber monocoque developed and produced by Audi using a new type of technology withstood the impact. The front crash absorber and all other passive safety devices of the car fulfilled their purpose as well. Mike Rockenfeller was able to climb out of the wreckage. As a precautionary measure, last year’s winner spent the night in the hospital but was released again on Sunday morning. On clinching its tenth victory in 13 years Audi has added another impressive chapter to its success story at the Le Mans 24 Hours. After the first success of a TFSI engine in 2001, the first triumph of a diesel-powered car in 2006 and the first exploits with variable turbine geometry, VTG, last year Audi again triumphed with innovative technology. "Audi ultra technology has passed an extreme acid test this weekend,” said Head of Motorsport Dr. Wolfgang Ullrich after the car had crossed the finish line. "If you pursue new paths this always involves a risk. But this risk has absolutely paid off. 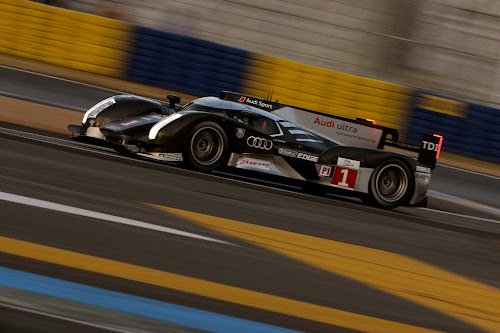 The Audi R18 TDI was in a class of its own at Le Mans 2011. Particularly due to the two extremely serious accidents this has been the most difficult Le Mans race for us in an emotional sense so far. That our team managed to keep the strong competition at bay for 16 hours with just one car is almost unbelievable. Everyone at Audi can be proud of this triumph. 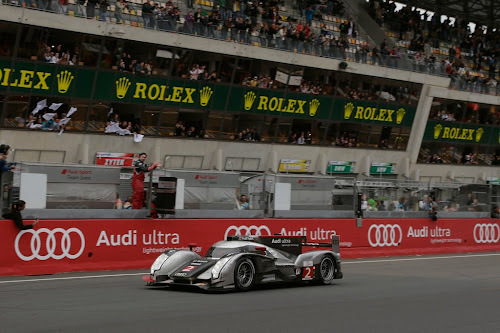 However, the news that Allan (McNish) and Mike (Rockenfeller) came out of these extremely heavy accidents so well is at least as important as that of the tenth Audi victory."